"It's not practical for me to keep it. I wouldn't wear it. It's just not who I am." 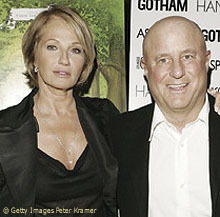 For years I couldn't quite get why Ellen Barkin married Ron Perelman. Yeah, obviously the money. Duh. But she seemed to love being a carnie, didn't she? She really seemed to love being an actress for the sake of acting, no? She was pretty talented, too. I loved The Big Easy. And then to give that love of being an employable, acting carnie up so she could have... what? An endless string of lunches at Le Cirque followed by chauffered rides to Bergdorf's where she could buy another Chanel suit, size zero, and then presumably get some sort of salon-type maintenance and then... what? Home to prepare for yet another evening out with Ronnie Baby? Yawn. After a while, all the niceties would probably get tiresome. Plus, Perelman? Eww. Order me an IV of something potent, stat. Is he loud? He just looks loud. And like he uses too much cologne. And in spite of the cologne, the smell of Scotch and rare ostrich meat and Stilton would overwhelm. Yuck. So while I can't imagine what a drag it must've been to have been married to that bombastic Ron Perelman, upon learning that Ellen Barkin had amassed quite a collection (17 pieces!) of super-reclusive Place Vendôme jeweler Joel Arthur Rosenthal's work (aka JAR) I thought, "Eureka!" If there was a thing that would've kept a girl around for that long, maybe the prospect of periodic trips to the atelier of JAR was it. Maybe. Now Ms. Barkin is getting set, with the help of Christie's, to auction off the (near) entire lot of her jewelry she collected while married to Perelman, 102 pieces in total. She is keeping one piece, a diamond ring, which is similar to the signature JAR "thread ring" at left. Platinum and diamonds, set in open-weave micro-pavé thread-like settings. Don't worry, of the 17 JAR pieces, there are four "thread rings." The most newsworthy of the pieces set for auction, of course, are the aforementioned 17 Rosenthal pieces. In the collection are also pieces from the Duchess of Windsor's collection, Doris Duke's estate, Cartier and Van Cleef & Arpels that Barkin owned during her marriage to Perelman. The auction, which will take place in October, is expected to fetch upwards of $15 million dollars. That, combined with whatever settlement one can squeeze out of an already thrice-divorced, über business-savvy, lawyered-to-the-gills billionaire, to whom one has been married for less than ten years in the state of New York (read: she doesn't get half, there were no kids, fo' shizzle there was a pre-nup, and no wonder she's selling) ought to set Barkin up for the future pretty nicely. She's already in Las Vegas shooting Ocean's 13, so that tells me what she really wants to be doing. "Less than 50 JAR creations have appeared in the auction market and all of them fetched considerably more than their retail price," said François Curiel, chairman of Christie's Europe and the auction house's head of jewelry. "They are considered museum pieces, so rare that there is virtually no limit to what collectors are willing to spend to own one. Our estimates appear to be always ridiculously low and I have even considered no longer publishing them when JAR pieces come up for sale. JAR defies all the rules of appraising jewelry." Rosenthal, 63, a New York native who moved to Paris in 1966, is said to produce 70 to 80 pieces annually. He uses high-quality precious stones like Golconda diamonds, Burma rubies, Kashmir sapphires and Indian emeralds, and puts intense labor into each piece. Socialite Lily Safra and Princess Firyal of Jordan are said to be some of his top clients. Anyhow, in the WWD article, Barkin talks about how she used to sleep in the earrings, and never treated the precious things as if they were, well, precious. And I am of two minds about that. First, I am glad she wore them, and wore them a lot. And second, I am glad she recognizes that she isn't the right owner for them anymore. She states that she and Rosenthal are personal friends. By this I assume that she has his blessing to sell the goods. Good luck, Ellen! I can call you Ellen, can't I? Go make some movies I'll see. Glad you're back in the "working actresses of a certain age" pool. Didn't even know I missed you. Can't stand that Susan SaranWrap woman. I'll go see Oceans 13. And 14. And 15... but that might be for Clooney, I won't lie, but I'll be glad to see you, too. Once again, the headlines bring us more disturbing news that Americans are as litigious as ever. This time via The Bling Blog's new friend Etienne Perret. Damn menacing squirrels. Doesn't this one look particularly dastardly? Read the article below and take a moment to think about what has happened to this country. And then feel free to comment. Try to limit your use of expletives to one per sentence. Should we hate what has happened to the legal system? Loathe the lawyers? Scourge the litigious scum? Don't hate the players; hate the game? I dunno. Please, no one ever serve this woman a hot cup of anything. Ever. Anywhere. A woman is suing a Chicago shopping center because a squirrel jumped on her leg in the center's courtyard. After leaving the Tiffany & Co. jewelry store at the open-air mall on December 3, 2004, Marcy Meckler claims she "had a squirrel jump up and attach itself to her leg." According to reports in the Chicago Sun-Times, the lawsuit, which was filed earlier this week, contends that Meckler "while frantically attempting to escape from the squirrel and detach it from her leg, fell and suffered severe injuries." The suit claims that the mall's parent company, Westfield Corp., "by and through its agents, employees, servants and security personnel, was aware of the longtime presence of the said squirrel on the premises and allowed the squirrel to remain on the premises, despite the fact that the squirrel had previously attacked and harassed other customers, a fact known to Westfield," reports the newspaper.